Invited talk on “Narrative Sense-Making – A Neurocinematic Approach” at the Max Planck Institute for Empirical Aesthetics (MPI), Frankfurt am Main, March 26, 2019. 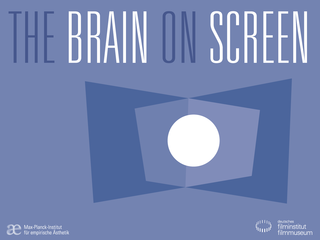 Presentation at the Cinema of the Deutsches Filminstitut & Filmmuseum, Frankfurt am Main, Brain on the Screen public series of 4 introductory talks: Ed Vessel, Vittorio Gallese, Marie Therese Forster, and Pia Tikka. 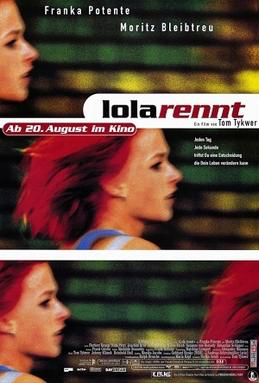 Run Lola Run (German: Lola rennt) is a 1998 German thriller film written and directed by Tom Tykwer, and starring Franka Potente as Lola and Moritz Bleibtreu as Manni. The story follows a woman who needs to obtain 100,000 Deutsche Mark in twenty minutes to save her boyfriend’s life. Was passiert in unserem Gehirn, wenn wir Filme schauen? Wie verarbeitet das menschliche Gehirn Filme – und warum ist das Sehen von Filmen genussvoll? Können Filme und das Filmpublikum überhaupt interessante Objekte der neurowissenschaftlichen Forschung sein? 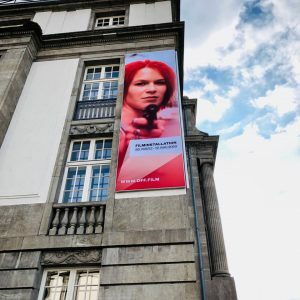 Diese und weitere Fragen stehen im Zentrum der Film- und Vortragsreihe „The Brain on Screen“, die das Max-Planck-Institut für empirische Ästhetik gemeinsam mit dem Deutschen Filminstitut & Filmmuseum im März 2019 veranstaltet. An vier Dienstagen (5., 12., 19. und 26.03.2019) werden vier Experten jeweils eine Einführung in vier Filme geben, die aus neurowissenschaftlicher Perspektive interessant sind. Während der anschließenden Film­vorführung hat das Publikum die Gelegenheit, hautnah mitzuerleben, wie neurowissenschaftliche Forschung zum Filmerleben aussehen kann. Wer möchte, kann Teilnehmer in einer den Film begleitenden Studie werden. „The Brain on Screen“ bietet einen wissenschaftlichen und praktischen Einblick in ein spannendes Forschungsfeld und verwandelt das Gehirn selbst in einen Akteur. Wenn Sie Interesse haben teilzunehmen, können Sie sich hier anmelden. Venue: AAB 905, Academic and Adminstration Building, Baptist University Road Campus, Hong Kong Baptist University, March 21, 2019. I will introduce my concept of enactive virtuality, associated with the idea of narratives as fundamental constructs of human mind. Inspired by the approach to enactive mind by Fransisco Varela and colleagues, the concept of enactive virtuality describes the experiencing mind as a dynamical system of body, brain, and the world. The epistemic triangulation is suggested as a means of translating the concept to practice. While audiovisual narratives have been shown to elicit very similar physiological responses in different viewers, however, individual life experiences define how the story is interpreted by each. The approach of triadic epistemology, a combination of methods from arts, social sciences, and psychophysiology allows generating integrated knowledge about how different viewers experience particular narratives. The method builds on the fundamentally pragmatist idea that no two domains of knowledge are enough to explain each other, but a third is always required to provide the interpretative angle. Therefore, understanding narrative content needs to be analyzed not only based on subjective reports of the viewers, because that is not anchored to any overall understanding, but they also need to be related to a neurophysiological repertoire of experiences. Similarly, being able to describe the neural activity data collected during the viewing of a film, it is not enough to relate it only to subjective reports of the viewers, but the observations also need to be interpreted to conventions of narrative dramaturgy and filmmaking. A selection of cases are described to clarify the concept of enactive virtuality and the proposed triadic method. 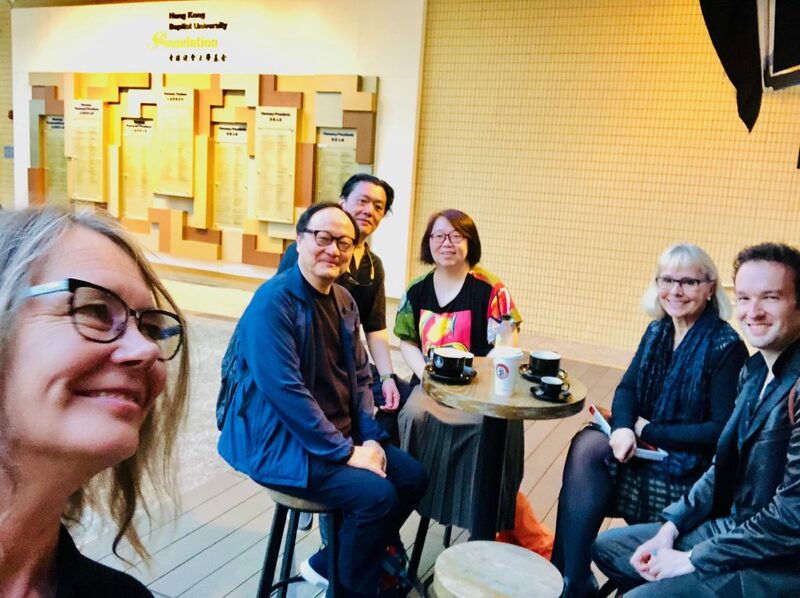 And a great aftermath of the Talk at the HKBU campus Cafe with Roger Carcia, Chianly Sze, Samantha Goh, Mette Hjort, and Eugene Birman. 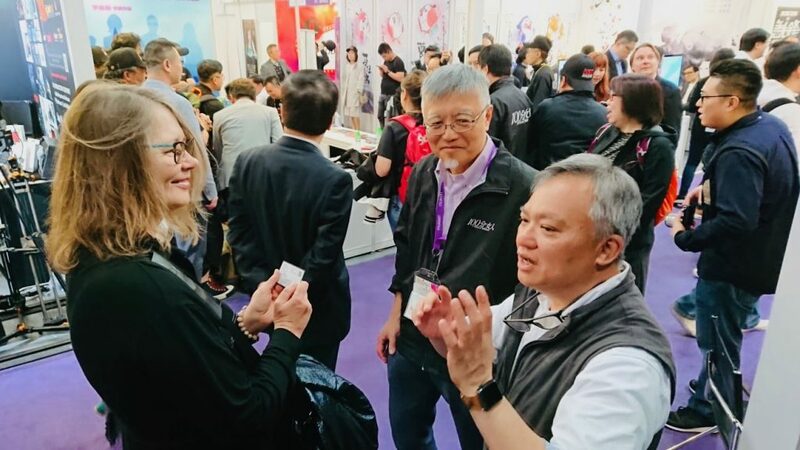 Visiting the Hong Kong FILMART booth of MANY VISION film production company. Executive Producer Stephen Ma (middle) and Johnny Ho, the founders of the Hong Kong Virtual Reality Network (HKVRN) together with my hosts Samantha Goh and Chianly Sze (HKVRN and Fatbars Ltd).